The Leyton ‘Tithe Map’, prepared in 1843 before most houses in our area had been built over, shows that the field edges were aligned with the Slip and the parish boundary, as was the road now called James Lane. Why ? Straight roads are usually attributed to surveying when Britain was part of the Roman Empire and swift movement by occupying legions was a key method of control. A section of Roman road has recently been found just off Capworth Street. 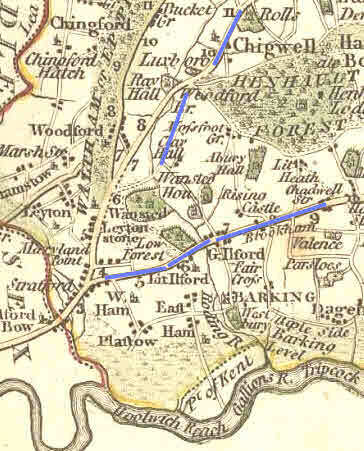 However, the Lea Bridge Road west of the junction with Church Road and Markhouse Road is much later than that, a new creation of the 18th century turnpike trust. Capworth Street does not fit into what we know of the Roman road system on this side of London.